On the weekend of 23rd and 24th June we will run a 101 and 102 workshop each day. On Saturday 14th July we will run another 101 workshop followed by an 102 workshop on Sunday 15th July. 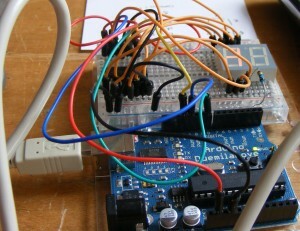 More details can be found on our Arduino Workshops page. 101 costs £50 including kit, or £20 if you supply your own. All workshop fees exclude booking fees charged by Eventbrite. Pre-booking is essential, if for some reason you cannot use Eventbrite, please contact info@nottinghack.org.uk. To book, click on the appropriate Eventbrite link below, and feel free to attend both!